In all honesty, I love rains. The heavy, you cant see whats in front of you, making loads of noise kinda rains, like the monsoons in Kerala. The story is different here because, you wont even know its raining unless you look outside. It comes and goes like a thief and quite unpredictably, like a woman. Like for example, yesterday I woke up to bright sunshine and brilliant 14C temperatures, windows were left open and beer bottles were opened. I went about making lunch thinking I would be able to take some pics finally (oh ya its always that way and not the other way round). By the time lunch was done, it was overcast and gloomy, threatening to rain. It finally did, around 4pm and I thought, perfect, let me grab a cup of tea and cosy up with a cookbook. Made tea in 5 mins, settled down on the couch with a throw and the rains had disappeared and the sun was out. So I jumped up immediately, frantically arranged my props, prepped up the food and yes, you guessed it right, it started raining. I was so pissed off, I didn't even have the energy to put back all the stuff I had painstakingly arranged (strewn all over the floor would be more precise). I hoped it would be sunny again and it did become bright for a couple of minutes, but by then I was so engrossed in the book, I couldn't care less. It's sad really, because it was a recipe I would have definitely loved to put up here. This morning isn't any better and the weather forecast says, its raining all week. So I guess the recipe is not meant to be displayed as yet..Sigh! 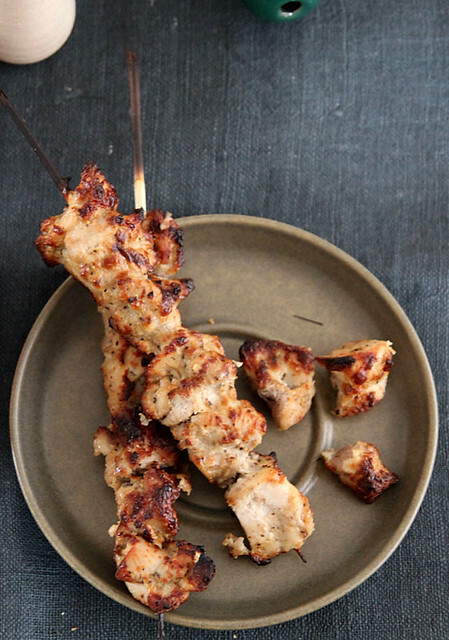 That brings me to this kebab recipe, which I did make on a rainy Sunday and was just the perfect thing to eat on a cold dreary day. The difference, however, was that in spite of the horrid lighting I still managed to take pics (of course they are not really the best, but I still made it work). 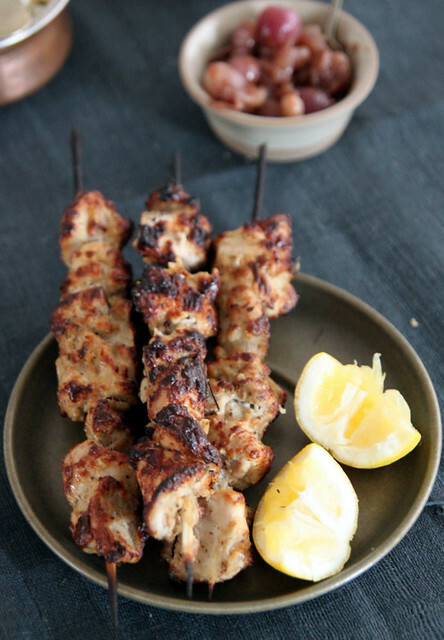 A friend and I were chatting about food a couple of weeks back and she said she tried these kebabs and they were great. I asked her for the recipe but she said she couldn't find it. So Google came to my rescue and I found a recipe which had all the yummy ingredients and immediately knew it would be a success. So I went about sourcing the stuff and made it the very next day. The outcome was this really cheesy, juicy and absolutely delicious kebab. 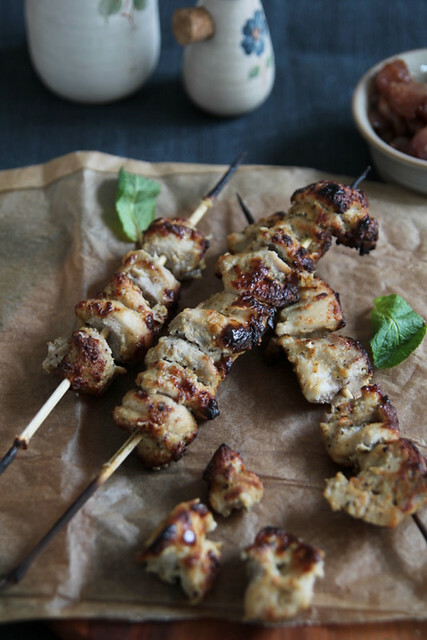 The recipe is more or less similar to the Reshmi kebab, but I would say this one is waay better and so so good, it puts other kebabs to shame, really, it does! I don't usually brag about the food i make unless its extremely good. and this definitely is high up there on the food pedestal. I cant wait to make it again (once my oven gets fixed). I must admit however, that the cardamom taste in this recipe is prominent and this, in spite of reducing it drastically from the original recipe. But I guess that's really one of the specialities of the dish. Do reduce it even more or omit it completely, if you cant stand it. 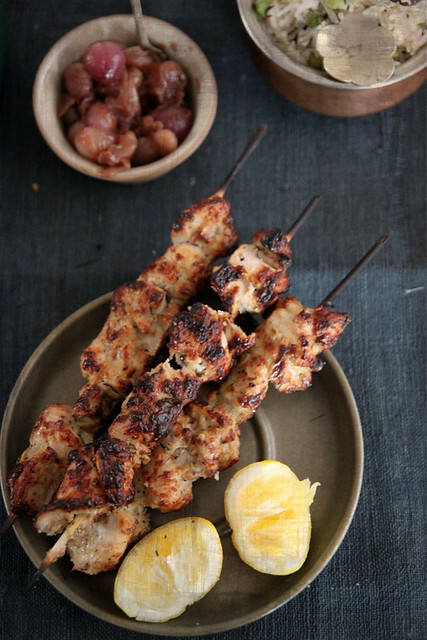 Cut up the boneless chicken pieces into bite size pieces (not too small) and marinate it with ginger, garlic pastes, vinegar and salt and keep aside while you get the remaining preps going. Soak the cashew nuts in milk for about 15 minutes and then blend to a smooth paste. Transfer the mix into a bigger bowl and add to it the grated cheese, cardamom powder, black pepper, and garam masala. Whisk the egg and cream together separately till just combined, and add it to the cashew-cheese mix. Mix till you get a smooth paste. Cover with a cling film and marinate it for a minimum of 1hr. I kept it in the refrigerator over night. About an hour or so before cooking, soak around 6 to 8 bamboo skewers in water. Also bring the marinated meat to room temperature. When ready to cook, preheat the oven in the grill mode. Thread the chicken on to the skewers, about 4 to 5 pieces per skewer (of course depending on the size of the pieces) and place on a baking tray lined with aluminium foil. Place under the grill and cook for about 6 to 7 minutes on one side. Take the tray out, turn the chicken pieces over, baste with remaining marinade if required, and place it back under the grill for a further 6-7 minutes or till the meat is tender and cooked through. Test this by inserting a fork into the centre and separating the flesh. If it falls off easily, you are good to go. Keep aside for about 5 minutes before digging in. 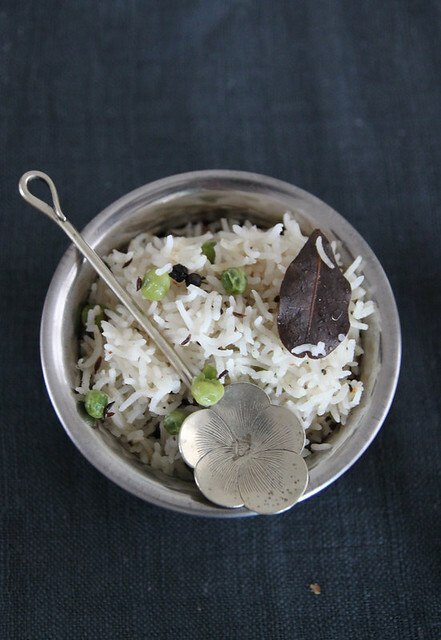 Serve with a green chutney as appetiser or with flavoured rice and raita as part of mains. Notes: Feel free to use chicken breasts instead of thighs. I find breasts absolutely tasteless- contextually speaking of course ;)- so never bother using it in any cooking. Use apple cider vinegar or any vinegar of choice (except for maybe balsamic and red wine vinegar). Cheese variety also can be varied I guess, but make sure you grate it fine because only then will they stick to the meat. Replace double cream with yoghurt or crème fraiche. If you don't want to grill the meat, then bake in an oven preheated at 176C for about 30 minutes, flipping sides and basting occasionally. Wash and drain the rice. Keep aside. Heat the oil in a wide, deep pan and add the cumin seeds. Once they start to splutter, add the black pepper, garam masala and green peas. Stir for a couple of seconds after which you add the drained rice. Stir fry on medium heat till the rice becomes slightly translucent. Meanwhile, boil 2 cups of water in a kettle and pour into the rice. Add enough salt and a dash of lemon juice (this prevents the rice from sticking to each other). Give on final stir, cover the pan with a tight lid, reduce heat to low and cook for about 15-20 minutes or till the rice is well done. 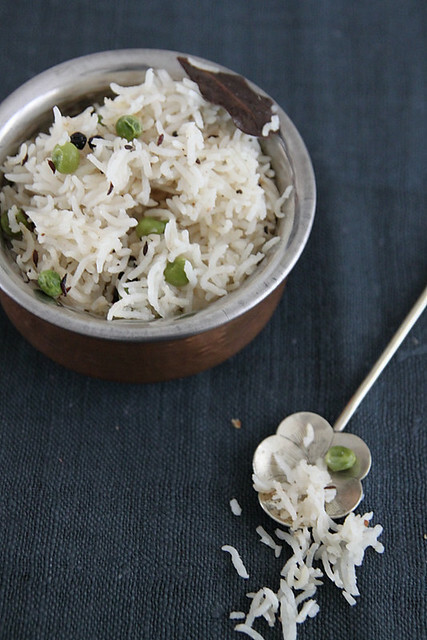 Remove from heat, fluff the rice using a fork and serve immediately. Notes: Use ghee instead of oil for a richer flavour. 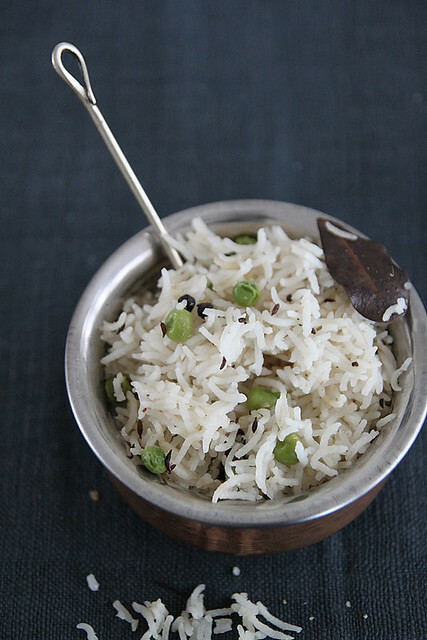 You can of course do a pulao version by sautéing onions etc etc,. Garnish with coriander leaves for that extra kick. I know the weather is been rubbish lately! Its quite frustrating to see all day rain/drizzle! But your pictures are uplifting and inviting and delicious. I love the rice serving spoon..again where do you get these things ?? Love how you compared the weather to a female :) I wish it were raining here too. In fact when the sky was laden with overcast today, I was so happy, but it drizzled for about 2 seconds & the sun was out :( I'm bookmarking this recipe, will let you know once I try it! there is a kebab shop here where we get the best ever kebabs so we r in love with kebabs now,I m sure I will try this out very soon. Fab post Nisha :) !! And i must say that its sheer coincidence that i made kababs too today and its been raining like crazy here in Ooty with no power since aftrenoon. I know the feeling of making great food and getting terrible low lighting pics. Having said that, your pictures are actually fab :)so dont worry. Waiting to try this recipe along with many others of yours. I never made rashmi kebab before. It looks super moist. I have to try this soon! Super delicious recipe and awesome photography !! Love your photos! and I'll give this recipe a try! Definitely! I love the pix !! The mood is so nicely depicted - am glad it was raining - love the play of light and u picked great colors !! Tempting combo...Lovely presentation and clicks.. This is irresistible,love your clicks dear..drooling.. 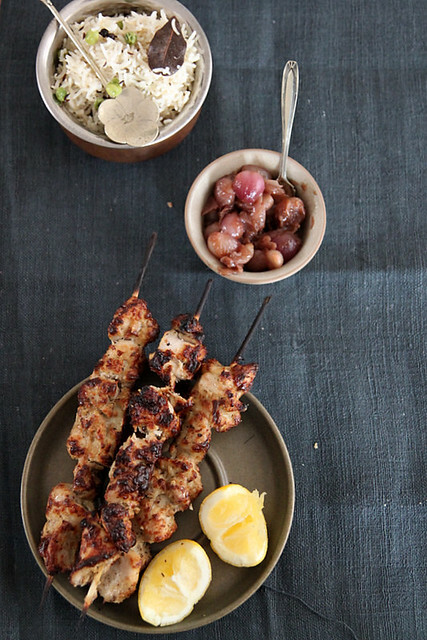 I love the photographs and the kebabs look mouthwatering. I can only imagine how tasty these must be. Rice bowl looks yummy n love your header! My oh my, these look fantastic! Your photos are also gorgeous! This looks too good! 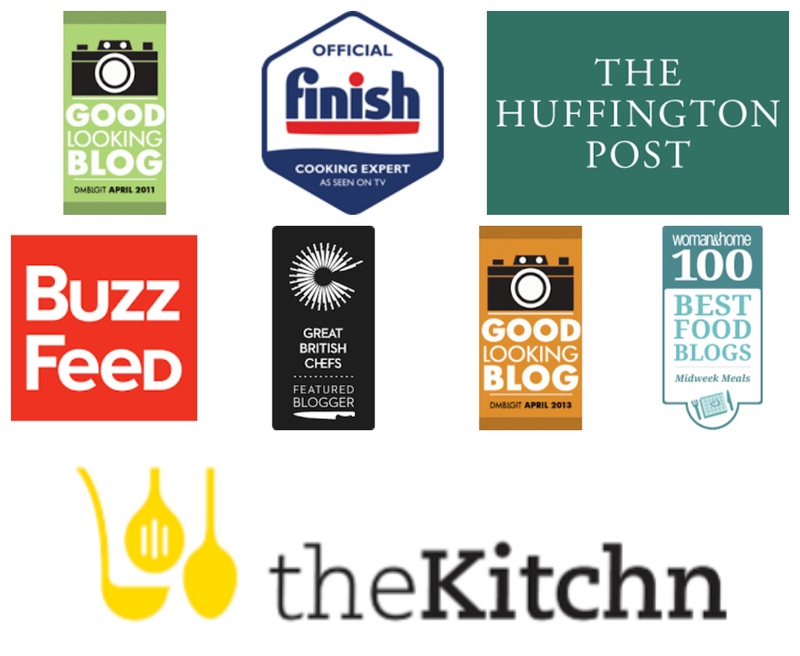 Love the photographs too and that pretty spatula for rice!